The fourth Touhoushinki (TKKH) member. He is by far the strongest member of the Touhoushinki (his strength in comparison to Kunieda is not confirmed, though it can be implied that he is stronger than her indirectly from their other fights). Toujou has an unexpected soft side towards smaller creatures and babies, though said creatures do not feel similarly towards him. He is mostly bored with weaklings and is always looking for a good fight, which subsequently leads to his interest towards Oga. He works multiple jobs and sometimes has to miss school because of them. 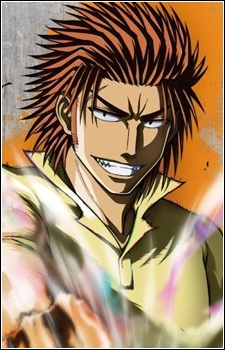 He can feel Saotome using his demon power, which shows he has notable strength for a human. He appears to know the female horsemen from Saint Ishiyama Academy (Shizuka Nanami) quite well. She referred to him as Tora when they met after the volleyball match. He sees Oga as a potential rival, while Oga sees him as an opportunity to lay off Baby Be'el on someone else. Oddly enough, despite his appearance, he seems to have a thing for cute animals. He is often absent from school due to working several part-time jobs. One of his jobs is construction work. Toujou usualy behaves very calm, much different from the usual delinquents that frequent Ishiyama High. Having a good control over his own emotions and being known to be very bottled up: no one knows what he is really thinking at the moment. But the most striking part of his personality is, of course, his love for good fights-- a trait that he also shares with Oga. When the oportunity to face a worthy opponent arises, Toujou will think very little about any kind of consequences that his actions may provoke, something that gets very obvious on his first bout against Izuma. Another thing he also shares with Oga on terms of personality is his lack of intellect and focus on more passive matters, being, evidently, more interested on resolving any kind of problem he has to face with his own bare hands. He also has a fond to cute or little animals and things, like cats or even Baby Be'el - when they first met. Tojo is exceedingly laid back (belying his true ferocity) and is often unresponsive to things that seem abnormal. Even after being kidnapped and undergoing a dimensional transfer, he remained asleep. He is also described as a good guy by normal standards.